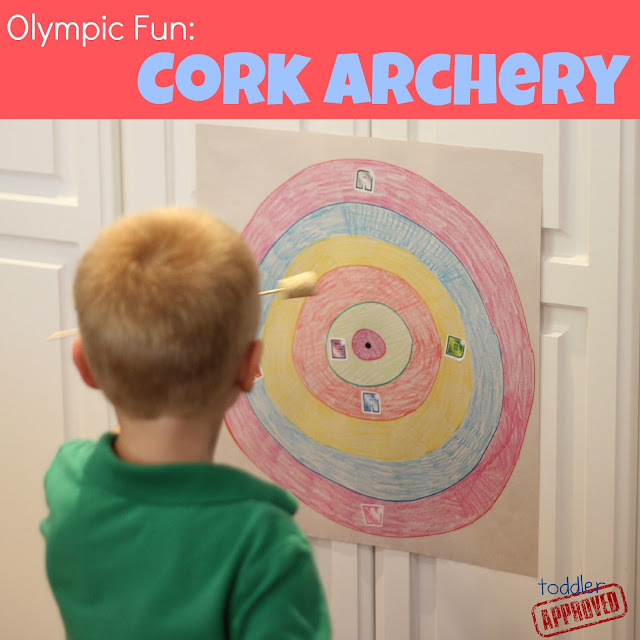 So, I was planning a week filled with Olympic posts featuring water events... and I'll definitely be sharing some of those... but with lots of Olympic Archery happening this week, we just had to post this fun activity today. When I think about archery I think about Brave (which we saw with my son on Saturday)... and then I think about danger and people getting hurt... so when I saw these safe awesome homemade paint arrows at Imagine Childhood, I knew that we could come up with our own kid friendly version that my son and I could quickly create. I am not as good with tools as the blogger mentioned above, so we kept it simple and made some cork arrows... but we skipped the bow. My son loved the activity without it... if yours doesn't, check out the link above and make your own. 1. Draw a simple target with crayons or markers on large drawing paper. 2. Add stickers all around the target as an extra challenge (We used the letters in my son's name). 3. Make your arrows by sticking the pointy end of the skewer into the small end of the cork. 4. Dip the cork into some paint. 5. Aim at the target (you can even pretend that you are using a bow) and launch the cork towards it and see if you can hit any of the colored rings or alphabet letters. We tried hitting them in order based on the spelling of my son's name... and then just randomly for fun too. * Make sure to use washable paint and do this somewhere where you are ok having a little paint mess. We put a plastic garbage bag on the wood floor and really didn't have much to clean up afterwards. If we had been doing this with my almost two year old it would've been much messier and I would've done it outside! ** If your child takes the skewer out of the cork and has the pointy side exposed, take the skewer away from them. The pointy side can hurt! Make sure that you supervise your child during this activity. This can be such a fun open-ended art activity too! Just stick up a white piece of paper on the wall and let your kids shoot their colorful "arrows" at it! The masterpiece will be so beautiful and different every time!! Have you watched any Olympic archery yet? What other events have been your favorites so far? PS- We made these fun Olympic brownies for a treat this weekend. They were delicious, so we had to share them with friends too! We'll be sharing Olympic themed activities this week as part of Toddler Approved's Camp Mom series in addition to a few other posts! Camp Mom Week 1: Camp Crafts. Camp Mom week 2: Bug Week. Make sure to stop by at the end of the week and link up your Olympic posts (or anything else you've been up to) in our Kid's Co-op Linky! Cork archery looks so cool. I would have never thought of that idea! where could I buy corks like that? I bought mine at Michaels Crafts!